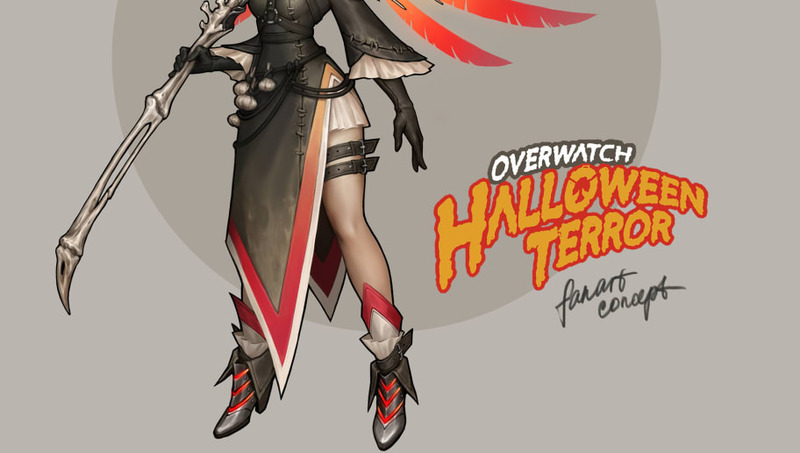 Overwatch fan and artist Natalie Lesiv created a striking original skin for Mercy in November themed around the plague doctors of medieval Europe. The skin shares some visual notes with the preexisting Overwatch skin Plague, which belongs to Reaper, but the two are distinct because of a few key details Lesiv adds to her creation. Where Plague uses green as its main accent color, Lesiv's Mercy is built around a vibrant red that glides into orange, almost yellow in some places. The effect is both unnerving (as a Halloween Terror skin should be) and warm, which is thematically simpatico with Mercy's status as the de facto Overwatch mom. The skin also includes an excellent spin on Mercy's Caduceus Staff, turning it into something like an enormous candle holder made of bone. The weapon wouldn't be hard to picture in the Grim Reaper's hands, but it's even more interesting as a healing device.